DataVac ESD Safe Maintenance System- Perfect vacuum for your office equipment - Computer keyboard, printer etc. An IT professional's dream, the DataVac® 3ESD is a complete anti-static vacuum/blower and dusting system developed specifically to keep expensive computers, printers, scanners, copiers, fax machines and other electronic office equipment, thoroughly clean and operating at peak efficiency. With it's 4-Stage HEPA filtration system, the DataVac®/3ESD is 99.97% effective at trapping dust particles as small as 0.3 microns preventing them from re-contaminating the office environment. It keeps all your high tech equipment running smoother, longer. 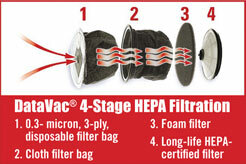 Unlike regular vacuums which redistribute the same dust, dirt and allergens back into the air, our HEPA filter-equipped environmental control system traps dirt and allergens into a tightly sealed filter bag. Built to Government Specifications! The new DATAVAC 3 ANTI-STATIC ESD SAFE with HEPA filter is 99.97% effective in trapping particles of dust down to 0.3 microns. It keeps all your high tech equipment running smoother, longer. Unlike regular vacuums which redistribute the same dust, dirt and allergens back into the air, our HEPA filter-equipped environmental control system traps dirt and allergens into a tightly sealed filter bag. Static is the #1 enemy of sensitive electronic equipment. DataVac ESD is equipped with a unique anti-static wrist-strap grounding the user from generating static. DataVac ESD has a virtually indestructible all-steel body featuring a 2-speed 1.7 peak horsepower motor. 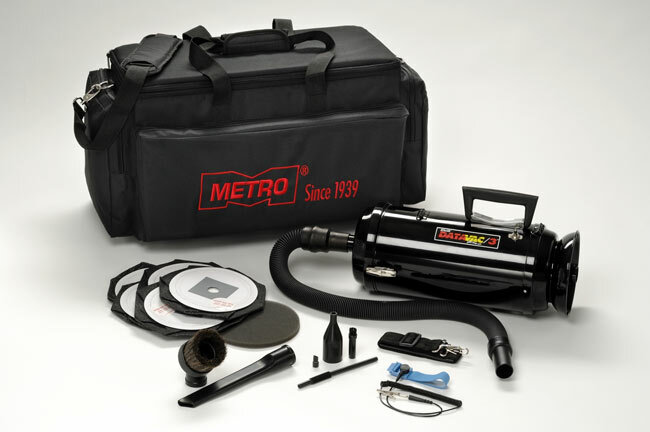 It comes with a complete set of static-fighting cleaning tools including a 3-6 foot expandable stretch hose, crevice tool, dust brush and 5 extra triple layer 0.3 micron disposable bags. In addition, a heavy duty foam-filled carrying case and shoulder strap make DataVac ESD easier and more convenient to use. Anti-static 3 to 6ft stretch hose, Wrist strap, Dusting brush, Crevice Tool, 4-piece Micro Tool Kit, 6 disposable Toner Filter Bags, Replacement Foam Filter, Shoulder strap, Full padded soft carry case. 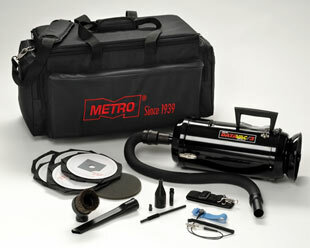 The DV/3ESD1 has an all-steel chassis construction, enclosed vacuum cleaning system, featuring a 2-Speed, 1.7 Peak Horsepower (100 CFM) Motor with 12 ft. grounded power supply cord, a .3 micron quadruple filter system (disposable triple layer .3 micron filter bag assembled with rubber diaphragm and peel-off pressure sensitive bag seal, permanent cloth bag and .3 micron HEPA certified filter. 1) A unique 0.3 micron 3-ply disposable filter bag, which may be sealed with an adhesive backed pressure sensitive bag seal located on the top of the bag. After the contaminated bag is sealed it is completely disposable. 2) A cloth filter bag. 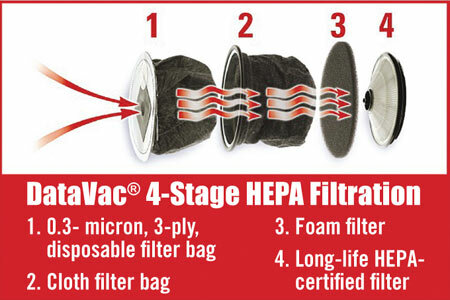 4) A HEPA CERTIFIED fourth stage filter mounted in front of the motor. The DV/3ESD1 includes a special set of ESD Safe Static Dissipative Vacuum Tools; 3 ft. to 6 ft. “Stretch” static dissipative Polyvinyl chloride (PVC), flexible hose, static dissipative Polyvinyl (PVC) Crevice Tool, static dissipative Polyvinyl (PVC) Dust Brush, Shoulder Strap and 5 extra triple layer .3 Micron disposable bags. The name of the material used on the hose is PVC (Polyvinyl chloride). The DV/3ESD1 vacuum set includes a Techni-Stat “No Doubt Wrist Strap” Ground Cord Set.The one-size fits-all, adjustable 100% silver-coated, monofilament, knitted nylon, wrist strap is highly conductive with a 5/8” non-conductive nylon inner-surface. The inner-surface has a surface resistivity of 10X3 MegaOhms/square inch. The Wrist-Strap connects to a 6-foot strain relief cord that features a 1 MegaOhm built-in resistor and attaches directly to vacuum. When stretched to 200%, strap returns to normal size after 20,000 cycles. Elastic ratio: 2.5:1. The entire vacuum unit is housed in a high-density Polypropylene (HDPE) Carry Case with 2 latches and deep bottom attachment tray. 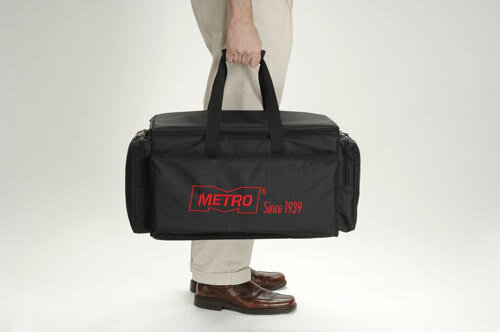 Case Dimensions: (L) 21-1/2” x (W) 12-1/4” x (H) 13-1/4”. 85” water lift (sealed suction measurement); 240V; 50 Hz.